Welp. It’s hard to believe we moved into our dream home exactly one year ago today! I can’t believe we have been here 12 whole months already. On one hand it feels like it’s gone by SO fast but on the other hand I’m pretty impressed with how we’ve managed to make this place our own in just a year. I thought I’d give you all a little home tour of all the spaces we’ve completed so far. We went from a 1,800 sq ft to 3,800 sq ft home which means we’ve basically started from scratch. It’s been a fun journey decorating our forever home and finding my style here. It took me a while to get into my decorating groove with this house, but now I feel like I’m on a roll. Kind of. I get asked a lot about how I found my personal style. To be honest, I think it’s a never ending journey. 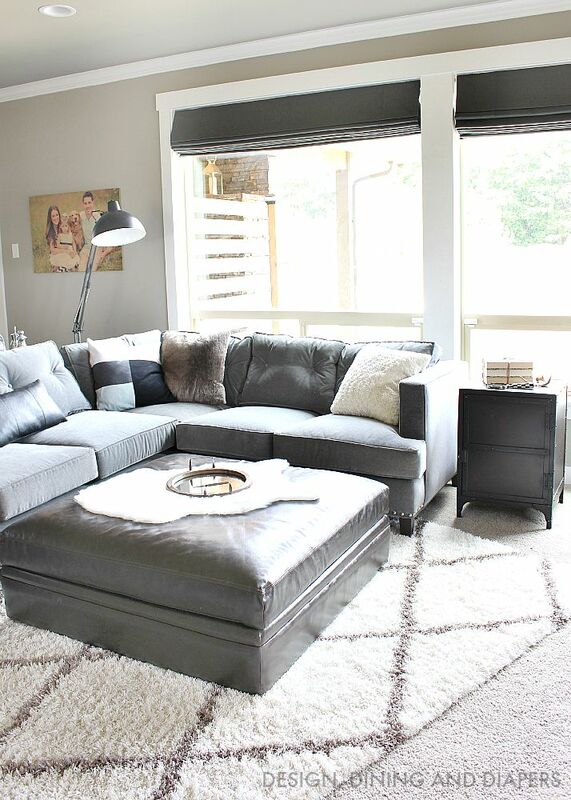 I’ve always leaned toward a more masculine, industrial style and figuring out how to blend that with the more glam/feminine finishes in the house has been a challenge for me. Sometimes I find myself wanting to lean more contemporary/modern and other times I want to incorporate more rustic and industrial pieces. For this house, I really wanted to stay true to my personal style but also blend it with the finishes that were already here. The overall look I want for this house is to be a mix of rustic chic with a little modern lodge. We live out in the country in the Pacific Northwest and I love brining nature into our home! Our Gray and White Kitchen is one of my favorite spaces in our home. I will eventually be switching out the chandelier for something more industrial, but for now I love spending the majority of my day in this room! It took us about 10 months to get our kitchen table finished, but it was worth the wait! You can read all about our experience putting together our live edge table here. 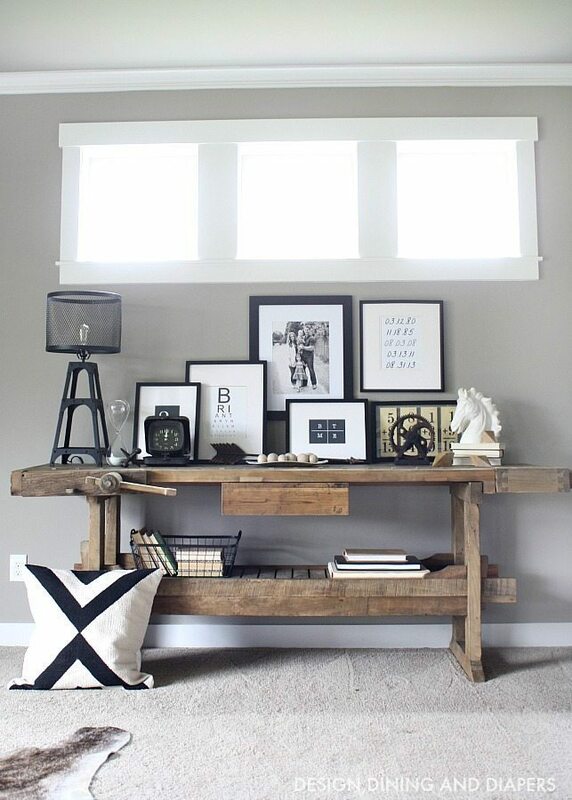 Our console table in our family room is my absolute favorite. You can view all the little details here. 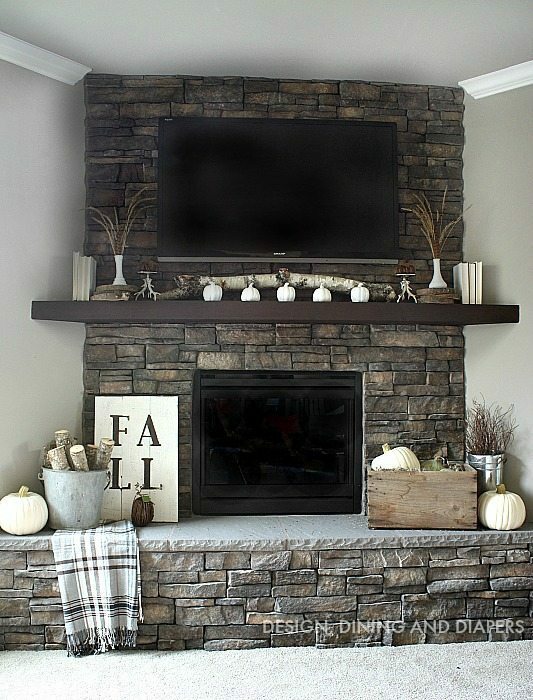 This is our corner fireplace in our family room decorated for fall! I generally keep very minimal decor up on the mantel throughout the year but I love dressing it up for fall and winter. I can’t wait to get started this year! View all the info on this space here. 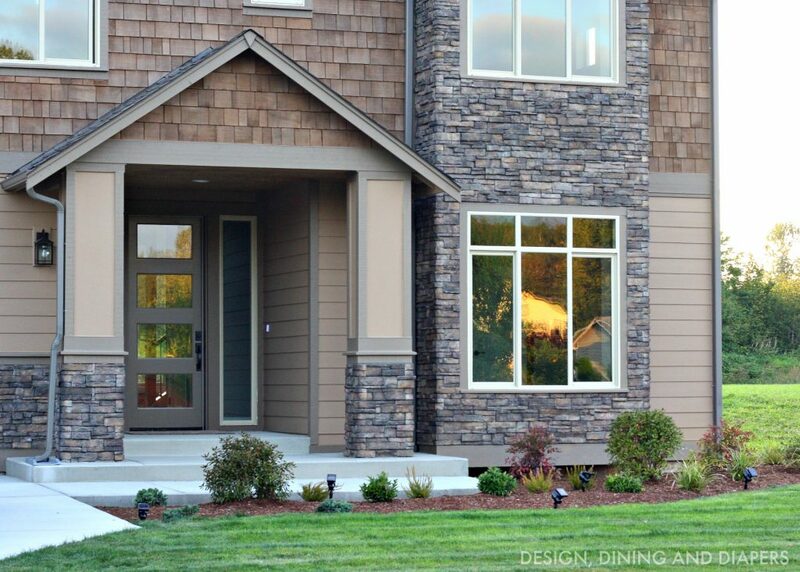 Our Outdoor Living Space sits right off our family room and kitchen. 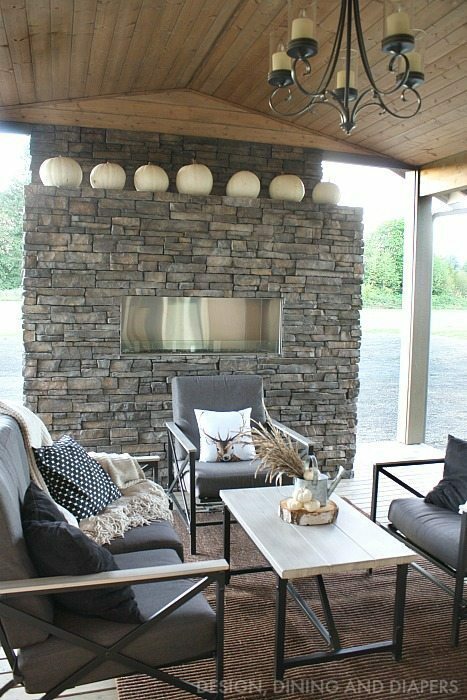 I love this space, we use it year round and when you live in the PNW, it’s great to have a covered outdoor area during the rainy months! This is also another space that I have fun with during the holidays. Little Man’s Rustic Bedroom is finished! You can stop by on Monday for a full reveal, but for now you can take a peek at the Wood Striped Wall, Piping Shelves and Half Reveal. 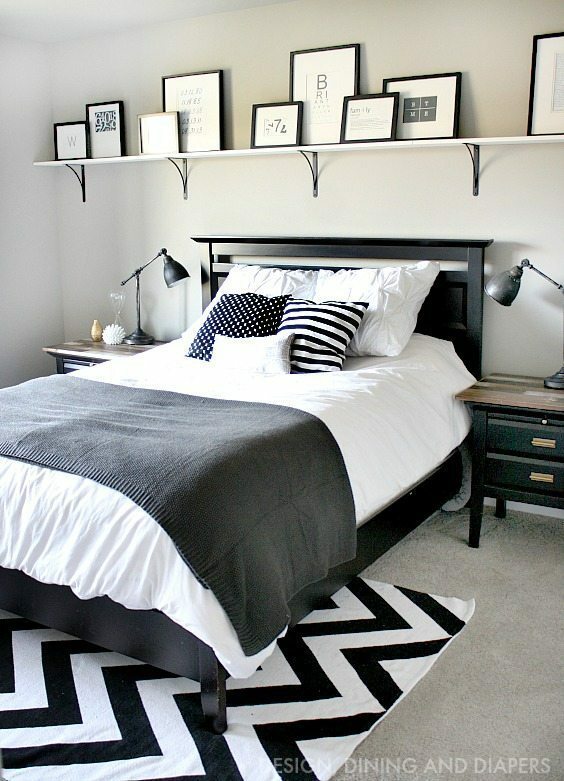 This is as far as I got with our Guest Bedroom and then I found as we were expecting baby #3! 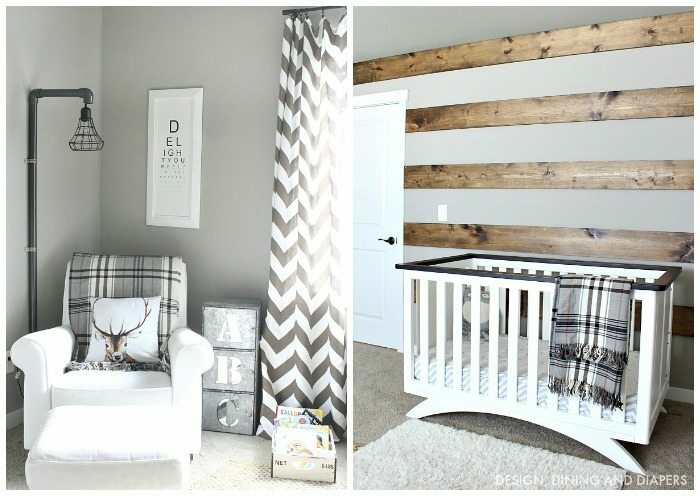 I’m in the process of slowly taking this room down and preparing for the new nursery. I’ll be sharing tons of new projects on this space in the next few months. Our Master Bedroom is still a major work in progress but I love seeing it come together. I really wanted a chic and cozy retreat for my husband and I. I have some really big plans for this space, but it’s going to be a long time until those happen! 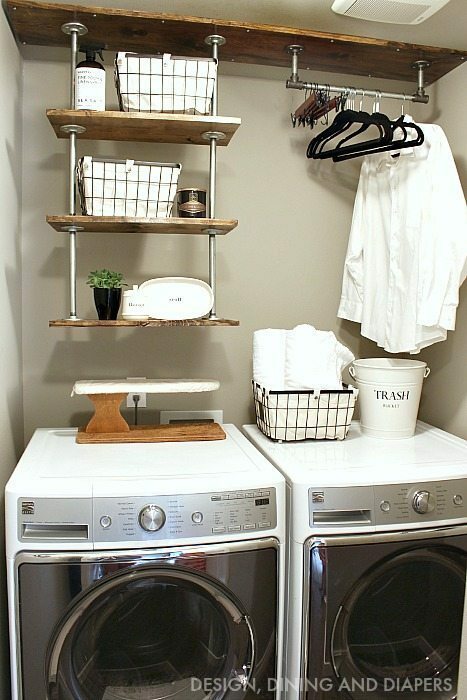 And lastly, I can’t forget our newly completed laundry room! I am so happy with how the pipe organization system turned out. I’d still like to put in a folding counter and maybe even tile, but this is a great start! I can’t believe we’ve put together all these spaces in a year! It feels so good. During year 2, you can expect reveals of all our bathrooms, the office/den, playroom/bonus room, and nursery! It is fabulous. I can’t really think of any other way to put it. Well done and thank-you so much for sharing . Are all of your white pumpkins from this year? We just picked one from the garden yesterday and it is the first one we have grown so far. (it was pretty exciting). It’s ALL fab, it truly is. But that live edge table is everything! It is just gorgeous! 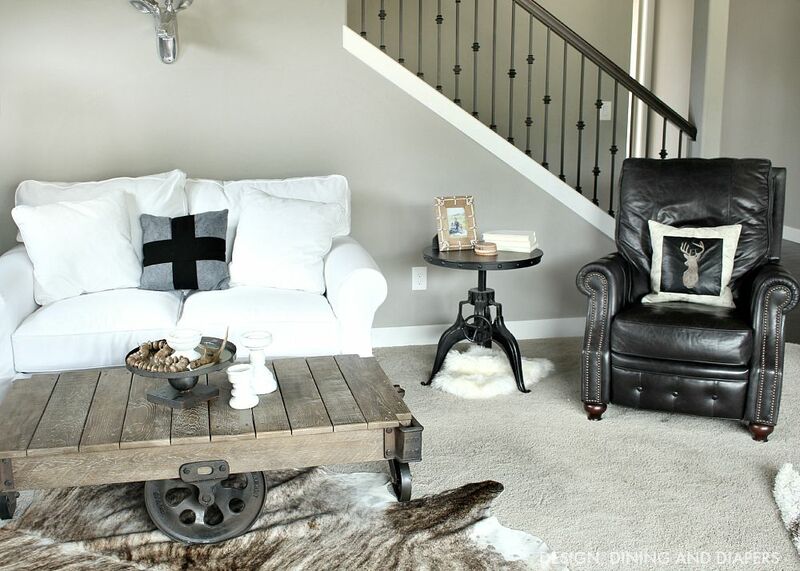 I love the rustic luxe look that comes so easily to you. 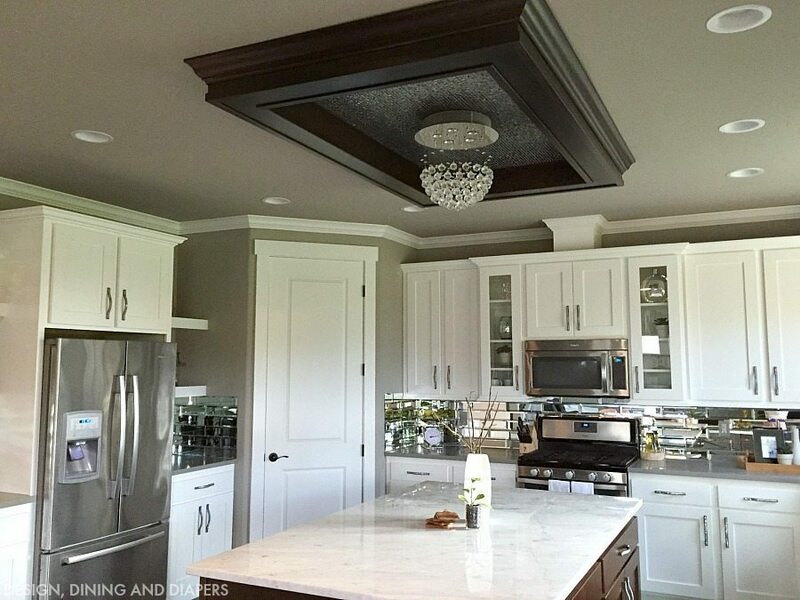 And I ADORE what you did with your kitchen ceiling! Your home is very pretty. 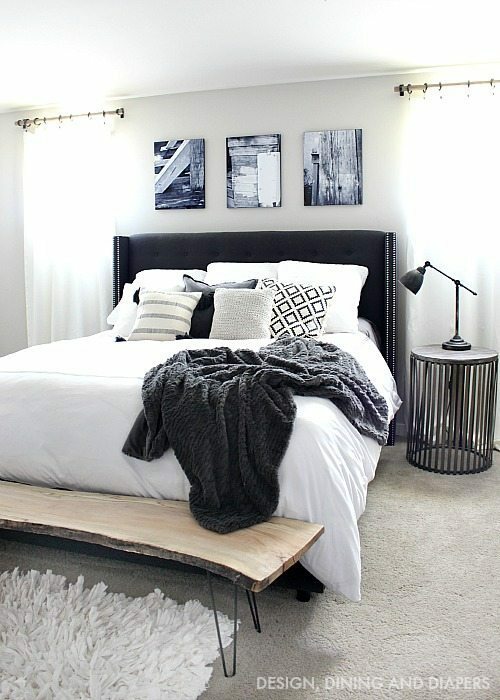 I love the warmth that the neutrals and textures bring to you spaces.. 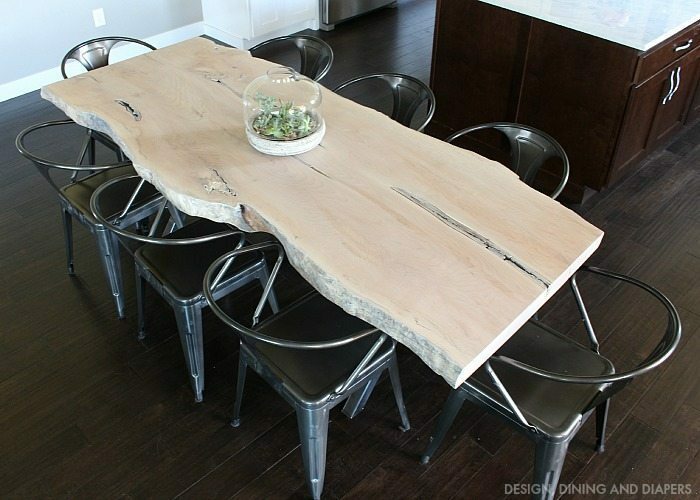 The live edge table and bench are especially great pieces. wow, looks amazing! You make me want to re-decorate something, lol. Such a beautiful home! You’ve done an amazing job of bringing your style into it! Wow, you’ve done so much in a year! I’m impressed! I like your modern rustic style, different than most design/decorating blogs I come across… BTW found you on Link Party Palooza. Thanks for the tour. 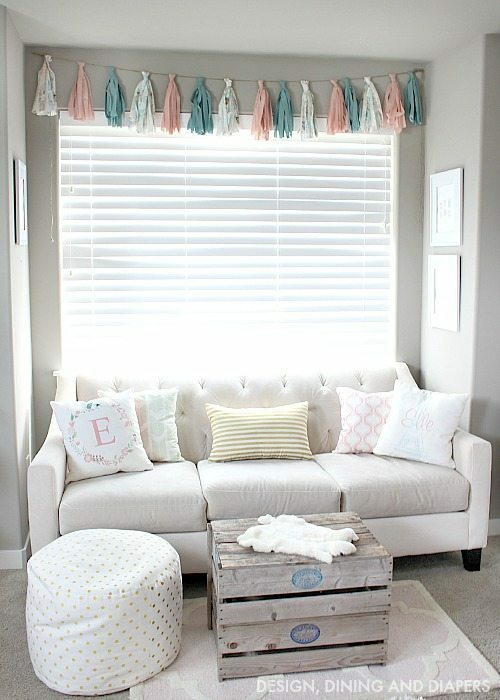 Love your decor style! The neutrals are fab!